Not to be confused with NES. Ness is a thirteen-year-old boy from Onett and the main protagonist of EarthBound (Mother 2 in Japan). Starting off as a normal young boy, Ness ends up on a journey to save the world from Giygas's alien army. He also develops psychic powers, known as PSI, during the course of the game. 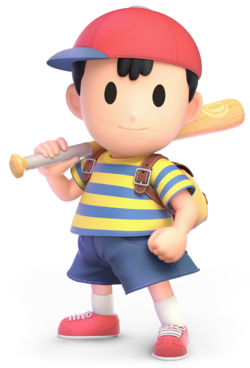 Ness is often pictured with a baseball bat, which is the first weapon acquired in EarthBound. Ness has been linked to the Mario franchise through the Super Smash Bros. series and some various small cameos involving other Nintendo characters such as the unlockable amiibo patterns in Yoshi's Woolly World and its port. Throughout the Super Smash Bros. series, Ness was voiced by Makiko Ōmoto, who also voices Kirby. Ness frequently appears as an unlockable character, being a default character in only two Super Smash Bros. titles. Ness's name is an anagram of "SNES", the shorthand term for the Super Nintendo Entertainment System, on which EarthBound was released (however, it is also like "NES" as in the Nintendo Entertainment System). Ness flies onto the battleground via PSI Teleport. Ness in Super Smash Bros.
Ness's first Mario franchise-related appearance is in Super Smash Bros., where he must be unlocked to become playable and is the sole rep of his series. To unlock him, the player has to beat 1-P Mode on Normal or higher difficulty with three or less lives, without continuing, as any character. The player then must defeat Ness in Dream Land in order to unlock him. Due to being an unlockable character, Ness himself does not appear in the game's 1P mode. Ness uses either his PK moves for his attacks or more physical-based ones. All of Ness's regular attacks involve physical moves, such as a punch kick combo with his jab or his headbutt as his upper aerial move. In addition, Ness uses a yo-yo for his up and down smash attacks and a baseball bat for his side smash attack, both of which are equipment in EarthBound. Additionally, the baseball bat can reflect projectiles. Ness throws his opponents using his psychic powers. When Ness jumps, he also uses his psychic powers to propel him through the air. Due to Ness's size, he has below-average weight, meaning that he is more easily knocked off the stage, but can escape combos more easily. If players press the taunt button, Ness looks at the screen, bows, and says "Okay!" Ness's stage entrance animation has him flying to the stage with PSI Teleport. Ness shares many animations with Mario in Super Smash Bros., such as his hurt, item swinging, walking, both pratfalled and face-planted prone animations, etc. In fact, his Fighting Polygon variant has a very similar appearance to Mario, with the most distinction giving to his smaller, lower nose and his jumps. Ness's special moves are based upon some of the various PK (Psychokinesis) moves from EarthBound. His neutral special is PK Fire, which sends out a bolt of lightning that creates a pillar of fire that traps opponents when it hits. His up special is PK Thunder, which sends out a controllable lightning bolt to attack. Ness has a unique recovery move in this game, in that Ness can strike himself with the PK Thunder to recover, which propels him to the direction depending on how the PK Thunder hit him. His down special is PSI Magnet, which can absorb energy-based projectiles to recover damage. None of these moves can actually be learned by Ness in EarthBound; they are instead those of his friend and teammate, Paula (although her trophy in Super Smash Bros. Melee suggests that she taught him these moves). Ness has an unused voice clip with him shouting PK Starstorm. PK Starstorm would not become Ness's move until Final Smashes are introduced in Super Smash Bros. Brawl. Ness returns in Super Smash Bros. Melee. Here, he is a default character at the beginning of the game. Originally, Ness was to be replaced by Lucas, the main protagonist of Mother 3. However, Mother 3 turned out to be delayed until after Super Smash Bros. Melee was released. As such, Ness was kept in to avoid confusion. While Ness retains many key features from the original Super Smash Bros., Super Smash Bros. Melee has seen drastic changes, where Ness has been given many tweaks. Many of his formerly physical moves now have Ness use his psychic powers, with examples being his dash attack and his forward and back aerial moves. When Ness jumps, he uses psychokinesis only for his second jump. Ness has been given down and up throws as new features to Super Smash Bros. Melee: his down throw has him throwing opponents to the ground and using PK Fire on them while his up throw involves him twirling his opponent and tossing them up, also with psychokinesis. Ness is given a new neutral special attack, PK Flash, which is one of his original EarthBound attacks, and it lets him release a ball of energy that can be charged as it rises and lowers to eventually explode. This replaces PK Fire as his standard special move, instead making it his side special move. Ness still retains most of Mario's animations, such as his Parasol drifting animation, though he has been given a new item swing animation. As Super Smash Bros. Melee has no unique stage entrance animations, Ness does not use his unique stage entrance in this game, though it returns in the next games. A team of three Nesses appear in Stage 9 in Adventure Mode. During this match, the only item that appears is Mr. Saturn. 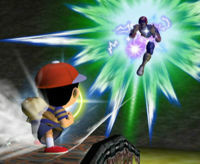 Ness appears in several of the game's events in Event Mode, either as the required playable character or as set opponents. In "Spare Change," Ness has to obtain 200 coins while fighting Captain Falcon, failing if Ness gets KO'd. In "All-Star Match 3," the player has to fight a set amount of characters in different stages, Ness being one of the opponents. In "Space Travelers," Ness, with one life, has to fight Samus, Kirby, Fox McCloud, Captain Falcon, and Falco in a row. The first three characters are fought in Fourside while the last two are fought on Battlefield. Onett, Ness's hometown, is featured as a stage in Super Smash Bros. Melee and returns in Super Smash Bros. Brawl, Super Smash Bros. for Wii U, and Super Smash Bros. Ultimate. Ness returns in Super Smash Bros. Brawl and is once again one of the unlockable characters. He is unlocked if the player plays five Brawl matches, reflects 10 projectiles, or recruits Ness as a member of the party in The Subspace Emissary. When any of these requirements are met aside from recruiting him in The Subspace Emissary, the player has to battle Ness in Onett, and by winning, Ness becomes a playable character. Ness is the only unlockable character who is fought from a returning stage from Super Smash Bros. Melee. Ness retains much of his moveset and his strengths and weaknesses from Super Smash Bros. Melee, with a few gameplay tweaks. Ness is given a variety of new animations to differentiate from Mario, and he now has an extra idle pose. In addition, Ness has been given a new pummel when attacking grabbed fighters, pummeling at a faster rate than when he once had Mario's pummel animations. 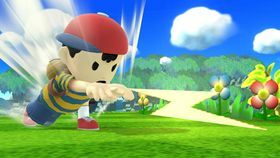 Ness has two more taunts as a result of Super Smash Bros. Brawl giving more taunts to all characters: Ness's side taunt has him swinging a bat while his down taunt has him creating a PSI sparkle effect. Lucas who is introduced in Super Smash Bros. Brawl, borrows many moves from Ness while been given slight variations: for example, Lucas's PK Thunder is weaker, but can travel through opponents and can be controlled more tightly. He is given a Final Smash which is shared with Lucas: PK Starstorm, which sends meteors raining down on the stage to damage opponents. In EarthBound, this move is learned only by Poo, though as with Paula's trophy in the previous game, Ness's Final Smash trophy suggests that he learned this move from Poo. In All-Star mode, Ness and Lucas appear in the 10th match, on the New Pork City stage, where character order is determined by chronological release of their series. Ness appears in four solo events and three co-op events in Event Mode. He appears as an opponent or with several opponents in "Visit to Onett," "The Aura Is With Me," and "All-Star Semifinal Regulars." In "The Slow and Easy Life," the player controls Ness and has to defeat three tiny Captain Olimars before the song ends. Ness is the playable character in "Those Who Wait in Onett" and an opponent in "Jigglypuff's Great Comeback." In both co-op events, Ness is paired with Lucas. When Lucas is attacked by The Pig King Statue at the Ruined Zoo, Ness arrives and uses PK Flash on it to save Lucas. The statue explodes, revealing Porky in his Spider Mech. Lucas and Ness then both fight Porky and defeat him. However, after his defeat, Wario, with his Dark Cannon, comes and attempts to shoot Ness several times. Ness avoids all the shots so Wario decides to aim for Lucas. Wario shoots an arrow out of the gun and it flies straight at Lucas - Ness however jumps in front of the arrow to save Lucas, and ends up becoming a trophy. Wario grabs the trophy and starts laughing while Lucas runs away terrified. Wario later travels in his Cargo with the princess trophy (the one that wasn't rescued at Midair Stadium) and the Ness trophy. After finding the Luigi trophy, he decides to take it. However, King Dedede steals the Cargo and drives off with all three trophies, as Dedede had been using Luigi to distract Wario. Later, at King Dedede's Castle, Dedede puts a timed Badge on the Ness trophy, along with the other two trophies. Dedede ends up becoming a trophy not long after, and the princess was captured by the Subspace Army again. Later, the Ness, King Dedede and Luigi trophies end up in Subspace. Near the end of the game, Tabuu turns all characters into trophies. Meanwhile, Luigi and Ness are both turned back to life. This is because the badges that King Dedede put on them had the power to turn revert trophies to their living counterparts, but this didn't happen until a long time later. Ness and Luigi revive King Dedede (who is overjoyed that his plan worked out), and they go out together into Subspace itself where they turn Mario, Donkey Kong, Samus, Fox, Pikachu, Captain Falcon, Marth, Mr. Game & Watch, Falco, Pit, Olimar, Lucas, Diddy Kong, the Pokémon Trainer, and Ike back into their living counterparts. Ness and Luigi also witness King Dedede's battle with Bowser and convince Wario about the truth of the situation. All trophies (including Kirby and the ones he rescued) then endure the Great Maze and fight Tabuu. Ness reappears as a playable fighter in Super Smash Bros. for Nintendo 3DS and Super Smash Bros. for Wii U. 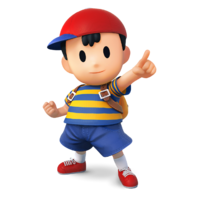 In the Nintendo 3DS version, Ness is unlockable; he is unlocked after either Classic Mode is completed twice or 10 matches are played, then by defeating him in a 1-stock match on the Magicant stage. In the Wii U version, Ness is a default character. Ness's base moveset and utilities are still unchanged, albeit with a few tweaks for rebalancing him that occur from game to game. Ness's down aerial now has a psychokinesis effect as opposed to it being physical in the previous games. Ness gains the ability to use PK Thunder again immediately after hitting the wall, for a potential second attempt at using the move. Additionally, at the very start of the move, Ness's PK Thunder moves through opponents, decreasing the opportunity for opponents to gimp him. Ness receives new custom special moves though half of his alternate special moves originate from Lucas's variants of his special moves, such as PK Freeze and Lasting PK Thunder. In addition, PK Starstorm has been changed to be more concentrated rather than meteors falling across the stage, allowing players to control the column of meteors to a desired direction. For custom Equipment use, Ness uses bats, hats, and shoes. In All-Star mode, as the order of characters is chronologically reversed as it is from Super Smash Bros. Brawl, Ness is fought in Level 5 and Level 3 in the 3DS and Wii U versions of the game respectively. In Event Mode, Ness appears in three solo events and in two co-op event. In "All-Star Battle: Secret," as the event focuses on unlockable characters in previous games, Ness is one of the opponents fought. In "It's Past Your Bedtime! ", Jigglypuff needs to make a variety of children characters fall asleep with Sing, one of them being Ness. In "Playing Tricks," Ness needs to bury two Villagers with a Pitfall. In co-op events, Ness appears as an opponent in "The Ultimate Battle," where players must defeat the entire roster. Ness, paired with Villager, is the character featured "Visiting Onett," where they must defeat Kirby, Meta Knight, Fox, Falco, Olimar, and Rosalina & Luma. Ness appears as an unlockable playable fighter in Super Smash Bros. Ultimate. While his moveset is mostly unchanged from the previous Super Smash Bros. titles, he has received various new tweaks to his moves. Ness now emits PSI when pummeling opponents and while using his neutral aerial. His up aerial, rather than headbutting, has him waving his hands in the air. In addition, for his PK Fire and PSI Magnet moves, graphics are taken from EarthBound. Several of Ness's attacks receive names: his forward smash is called Batter Up!, his up smash is called Around the World, his down smash is called Walk the Dog, his forward throw is called PK Throw, and his back throw is called Reverse PK Throw. Lucas New Pork City You Call This a Utopia?! PK Fire is a PSI attack appearing in every installment in the MOTHER / EarthBound series and as Ness's standard special move in the original Super Smash Bros. and his side special move from Super Smash Bros. Melee onward, shared with Lucas. When used, Ness throws a bolt of lightning from his fingertips, which travels at a downward arc. When used in the air, the bolt travels at a greater downward arc than on the ground. Upon hitting the ground or an opponent, the bolt creates a pillar of fire that deals continuous damage until it disappears. Ness also uses PK Fire for his down throw, though in Super Smash Bros. for Nintendo 3DS / Wii U, the fire is absent. In Super Smash Bros. for Nintendo 3DS / Wii U, PK Fire's first custom variant is PK Bonfire, which fires a bolt of lightning that does not travel as far or as fast, with higher start-up and ending lag, but the fire it creates upon hitting lasts longer, deals more damage, and has more upward knockback. The second is PK Fire Burst, which behaves similarly to Lucas's PK Fire in that it knocks away opponents and the PK Fire does not last long; this move has more start-up lag than normal PK Fire. In Super Smash Bros. Melee, the trophy for Paula suggests that she taught him this move along with PK Thunder, since Ness cannot learn these moves in EarthBound. PK Flash is Ness's standard special move since Super Smash Bros. Melee, replacing PK Fire, now his side special move, in the original Super Smash Bros. The move is based upon the PSI attack introduced in EarthBound. When used, a ball of light appears above Ness that can be charged by holding down the special move button, rising and falling. 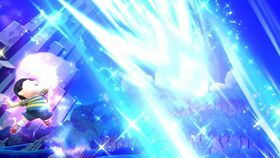 By releasing the special attack button, the ball of light explodes, the explosion more powerful the longer it is charged. The attack automatically explodes if it reaches the same height at which Ness used the attack; if it hits the ground or a platform before it can be detonated, however, it disappears without exploding. The angle at which the attack moves can also be adjusted by tilting the control stick left or right. If it is used in the air, Ness is left helpless after the explosion, though in Super Smash Bros. Ultimate, he no longer becomes helpless. In Super Smash Bros. for Nintendo 3DS / Wii U, PK Flash is given more range when angled behind Ness than in previous games. Also in Super Smash Bros. for Nintendo 3DS / Wii U, there are two custom variants of this move available to unlock. The first is Rising PK Flash, which fires a pink ball of light that only rises into the air; it has a larger range but deals less damage, and cannot move as far horizontally. The second variant is PK Freeze, Lucas's version of this move; it does not deal as much damage, instead freezing opponents, and also detonates when it hits ground. This PK Freeze travels more slowly than Lucas's version, behaving more similarly to Ness's PK Flash, but still moves faster and has further range than PK Flash. The frozen effect is stronger than most freezing attacks, as opponents require more effort to break free out of a sweet-spotted PK Freeze. PK Thunder is Ness's up special move (shared with Lucas), and a PSI attack appearing in every installment of the MOTHER / EarthBound series. 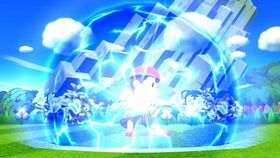 When used, Ness fires a ball of lightning that can be controlled using the control stick; when hitting an opponent, it hits one time before disappearing. While controlling the lightning ball, hitting Ness himself with it causes him to fly in the opposite direction he was hit. Like with the standard PK Thunder, this form of attack deals one hit with high knockback. In Super Smash Bros. Ultimate, a trajectory arrow appears indicating the direction Ness flies if he hits himself with the lightning ball. In Super Smash Bros. for Nintendo 3DS / Wii U, PK Thunder's first custom variant Lasting PK Thunder, which behaves like Lucas's version of the move in that it can pass through opponents and controls more tightly, though it deals less damage. When it hits Ness, it propels Ness further than regular PK Thunder. The second variant is Rolling PK Thunder, which is larger, more powerful, and colored green, but does not move as quickly; hitting Ness also gives less distance, though it is also more powerful. In the MOTHER / EarthBound series, Ness and Lucas are unable to learn PK Thunder in their respective games; in Super Smash Bros. Melee the trophy for Paula, one of the characters who learns PK Thunder, states that she taught Ness this and PK Fire, though no explanation is offered for Lucas. This explanation further returns as a random tip in Super Smash Bros. for Nintendo 3DS / Wii U.
PSI Magnet is Ness's down special move (shared with Lucas) and a PSI attack in the MOTHER / EarthBound series. 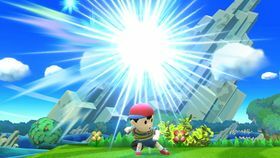 When used, Ness surrounds himself with a field of energy that absorbs energy-based projectiles to recover damage. Since Super Smash Bros. Brawl, when the attack ends, Ness pushes away any nearby opponents and items. PSI Magnet additionally slows Ness's descent. In Super Smash Bros. Ultimate, Ness's PSI Magnet damages opponents who are near it, as well as pushing them towards Ness. In Super Smash Bros. for Nintendo 3DS / Wii U, the PSI Magnet's first custom variant is PSI Vacuum (named PSI Vortex in the PAL release), which does not have health recovery properties but draws in opponents to damage them when the attack is finished. 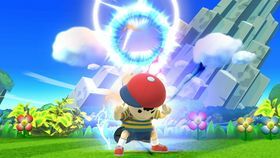 The second variant, Forward PSI Magnet, behaves like Lucas's PSI Magnet, where the energy field appears in front of Ness and instead of blowing opponents away, damages opponents when Ness finishes the move. PK Starstorm is Ness's Final Smash, which he shares with Lucas. The move is based upon the PSI attack appearing in both EarthBound and Mother 3. When used in Super Smash Bros. Brawl, Ness summons meteors that rain down outward and individually onto the stage, damaging anybody hit by them. In Super Smash Bros. for Nintendo 3DS / Wii U, the meteors no longer rain down randomly across the stage, instead being concentrated in one area, raining down from the center of the stage. The angle at which the meteors fall can be adjusted with the control stick, and the meteors now deal fire damage. In Super Smash Bros. Ultimate, PK Starstorm has been changed to be more similar to the Super Smash Bros. Brawl variant, and Paula and Poo now appear beside Ness to assist him. In EarthBound, Ness does not actually learn PK Starstorm. According to his Final Smash trophy in Super Smash Bros. Brawl, it is stated that he was instead taught by Poo, who learns the move in the original game. A Yoshi design based after Ness can be unlocked in Yoshi's Woolly World and Poochy & Yoshi's Woolly World when players scan a Ness amiibo in. Ness makes a cameo appearance in Super Mario Maker as an unlockable amiibo costume for Costume Mario. Mario's 8-bit sprite takes the appearance of Ness, and his sound effects change to ones from EarthBound: when acquired, the PSI healing sound effect plays. Clearing the stage plays the boss victory theme. When falling into a pit, the sound effect of Ness's party being defeated from that game plays, and pressing on the controller makes the jingle for learning a new technique play. The costume is unlocked either randomly upon completion of 100 Mario Challenge on Normal difficulty or higher, or by scanning a Ness amiibo. Website: Unlock the Earthbound hero by finishing the game on the Normal difficulty, with only three lives and without continuing. It's quite a feat, but the plucky little guy is worth it. His Psi attacks will drive the other players mad. In-game description: Ness was a seemingly-average kid from Onett, but in truth, he was destined for much more. When a strange meteorite landed near his hometown, the little boy with psychic powers set out to save the world. Little has been said of Ness' character, and much remains hidden. 06/95 Ness is a young boy who's mastered the psychic power known as PSI. Ness was living a normal life in the suburbs of Onett until a meteor crashed into a nearby mountain and sent him on a wild adventure. Believing in the ultimate powers of wisdom, courage, and friendship, Ness proves that some heroes come in small packages. Smash B: PK Fire The key to mastering Ness is controlling his unique midair jump, which makes up for what he lacks in speed. His PK Flash attack may seem weak at first glance, but it grows more powerful the longer you hold down the B Button. To do a lot of damage with PK Fire, try to burn your opponent as many times as possible. Down & B: PSI Magnet Ness's mind is his best weapon. PK Thunder is a PSI missile weapon that can be guided using the Control Stick, and if Ness hits himself with it, he turns into a living missile capable of doing massive damage. This move can also be used for recovery. PSI Magnet turns energy missile attacks into health; try out certain Pokémon for stamina replenishment. N64 Super Smash Bros. An average boy whose life changed when he found a meteor and an alien on a nearby mountain. The alien warned him of a future threat, and adventure ensued. He can use psychic energy known as PSI and also wields a bat and yo-yo. This brave youth gives his all to defeat the evil Giygas. Wii Super Smash Bros. Brawl Ness as he calls down a host of damage-dealing stars in his Final Smash. Everyone on the screen must dodge like crazy to avoid getting hurt, but that's no easy task. This attack appeared in the Mother series, but it was Poo, not Ness, who wielded it. Perhaps Poo taught Ness the secret of the attack for use in Super Smash Bros. Brawl. Colonel: That kid... Isn't that Ness? Colonel: He may look like a mere boy, but don't let that fool you. He has PSI abilities that defy all scientific explanation. Colonel: Exactly. He can use teleportation, levitation, pyrokinesis, and psychokinesis. Snake: Yeah, but the question is, can he read minds? Colonel: Not to my knowledge, no. Snake: Good. Then I won't have to worry about him predicting my every move. Colonel: Even if he had telepathic powers, I don't think he'd use them to mess with you like that. I hear he's a good kid. (3DS) N/A NA: Hailing from Onett, a small town in Eagleland, this young boy's ordinary looks hide his psychic powers. Ness fought against the evil Giygas in EarthBound, and in Smash Bros. he unleashes some of the same PSI moves. Watch out for PK Thunder, a guided attack that can also launch Ness like a rocket! PAL: From Onett in Eageland comes this young lad. He may not look like much, but he has powerful psychic abilities, and they really come in handy in EarthBound. They come in handy in this game, too. Did you know you can control his PK Thunder bolt? Aim it at Ness himself to send him flying, absolutely clobbering anyone in his path! (Wii U) SNES EarthBound (06/1995) Hailing from Onett, a small town in Eagleland, this young boy sports ordinary looks that hide his psychic powers. Ness fought against the evil Giygas in EarthBound, and in Smash Bros. he unleashes some of the same PSI moves. Watch out for PK Thunder, a guided attack that can also launch Ness like a rocket! (3DS) N/A NA: Ness may have psychic powers, but that doesn't mean he shies away from getting physical. His side smash packs a real punch if you hit enemies with the end of his bat, and it can even deflect projectiles! His up and down smashes also have a lot of range—Ness can land his strikes with ease! PAL: Ness may have psychic powers, but that doesn't mean he shies away from getting physical. His side smash packs a real punch if you hit enemies with the end of his bat, and it can even reflect projectiles! His up and down smashes have a lot of range, meaning when you play as Ness, it's always easy to land hits on your foes! (Wii U) SNES EarthBound (06/1995) Ness may have psychic powers, but that doesn't mean he shies away from getting physical. His side smash packs a real punch if you hit enemies with the end of his bat, and it can even deflect projectiles! His up and down smashes also have a lot of range–try giving them a spin! N/A In EarthBound, this PSI ability belonged to Poo, the Crown Prince of Dalaam and one of Ness's friends. Ness must have learned it especially for Smash Bros.! The attack makes a shower of meteors fall onto the stage, damaging any foes it hits. While the attack's in progress, Ness is invincible and can adjust the meteors' trajectory. Pit: I'm picking up on some weird kind of energy here. Palutena: What you feel is Ness's PSI. Palutena: It's a general term for supernatural abilities. Pit: Supernatural?! Isn't that pretty unscientific? Palutena: Said the angel to the goddess. Pit: What are you getting at? Palutena: Pit, we're having this conversation via telepathy. Meanwhile, the power of flight is a type of psychokinesis, and I see you from the heavens using clairvoyance. Finally, I call you back from the battlefield with something akin to teleportation. Palutena: Anyway, if Ness tries to recover via PK Thunder and you reflect it, that will really ruin his day. Give it a try when you get a chance! "PK Fire!" - Super Smash Bros.
"PK Thunder!" - Super Smash Bros. "Okay." - Super Smash Bros.
Ness and Lucas's victory theme is the title theme for the EarthBound Beginnings in Super Smash Bros. Brawl and Super Smash Bros. for Nintendo 3DS / Wii U. In the first two games, it is based off the "8 Melodies" theme from EarthBound. In Mother 2, the Japanese version of EarthBound, one of the default names for Ness is Mario. Ness is shown to have visible teeth in the cutscenes of the Subspace Emissary, despite not having any during actual gameplay. This distinction applies with Lucas as well. ↑ "To tell the truth, initially he was going to be replaced by the protagonist of MOTHER 3, but stuff happened and there were delays, so we ended up going back to the original. " (Japanese) Nintendo. Retrieved June 2, 2018. ↑ PushDustin. (April 13, 2015) The Definitive Unused Fighters List in Smash Source Gaming. Retrieved June 2, 2018. ↑ 10: Ness – Super Smash Bros. Ultimate. YouTube. Retrieved August 6, 2018. This page was last edited on March 16, 2019, at 19:54.